Canadian Artist Makes Breathtakingly Bold Portraits That Look Into Our Human Condition And They Will Inspire You! With so much darkness consuming the world, I have always felt a very real need for bold, vibrant, beautiful color to brighten up the world! My drive to paint expressively with color happens especially around the wintertime when in Canada, we have much shorter hours of sunlight. Along with the intuitive fusion of bright hues and slightly variating styles, this series of oil paintings was born out of my documentation of the specific introspective stages, which I was undergoing over the course of 2 years. The reflections are subtle yet effective, provoking the viewer to connect to their own experiences. 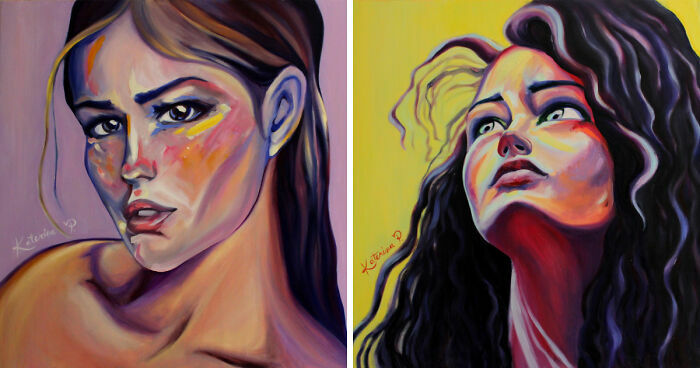 I hope that these captivating portraits bring you joy, light, and moments of beautiful self-reflection! The examination or observation of one's own mental and emotional processes. I love this one. Just right. The action of looking back on or reviewing past events or situations, especially those in one's own life. A method in which you get to know oneself by developing relationships and empathetic thinking with others. The state or feeling of being calm, confident, and in control of one's feelings; composure. "I told ya so!" Or just satisfied with oneself. An act of becoming fully aware of something as a fact. The act of making something better; improvement. 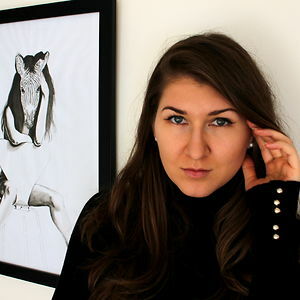 Katerina Pravda creates art with heart - bold portraits of people and animals, as well as surrealist combinations of the two. Elegant, unusual, yet strikingly beautiful. Perfect for all animal-lovers! I mean... with a title like this, you set the bar very high and you could only fail... These are ok drawings with nice colours, but please ditch those fancy titles, that'll spare you loads of criticism. These are beautiful :-) what's the medium?